Atlanta, GA, February 01, 2015 --(PR.com)-- Today is a miraculous day of hard work and perseverance coming to light. It all began when the founder of I Will Survive, Inc., lost a phenomenal woman to the fight against breast cancer at age five. That phenomenal woman was the mother of Anisa Palmer. Her purpose was found later in life, revealed by God through the continuous survival of tours in Iraq, serving in the United States Armed Forces. She founded I Will Survive, Inc. to “support the fighters” of breast cancer and a little over four years, moves into their first facility for I Will Survive, Inc. to run efficiently and effectively as a non-profit entity. Over the years, I Will Survive, Inc. has been able to provide free mammograms and thermography breast exams to those in need, pay for travel expenses to health care facilities for individuals surviving breast cancer, pay for medical bills, pay rent and utility bills, provide health food through the partnership of I Care Atlanta, provide cleansing treatments and care packages, provide massages to relieve stress, and more. Come on out to be inspired, to eat, and enjoy the family festivities for the ribbon cutting ceremony that will take place in honor of her mother’s birthday, the 18th of April. This day will be a day of celebration and remembrance. I Will Survive, Inc. will celebrate survivors and encourage all survivors to come out with your families. I Will Survive, Inc. will celebrate the board members, the dedicated volunteers, and constant donors who make I Will Survive, Inc. work week after week. 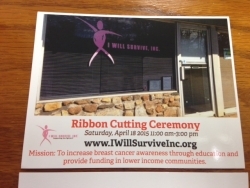 I Will Survive, Inc. will celebrate life, community, and sustainability. I Will Survive, Inc. will also honor those who lost the fight to breast cancer.